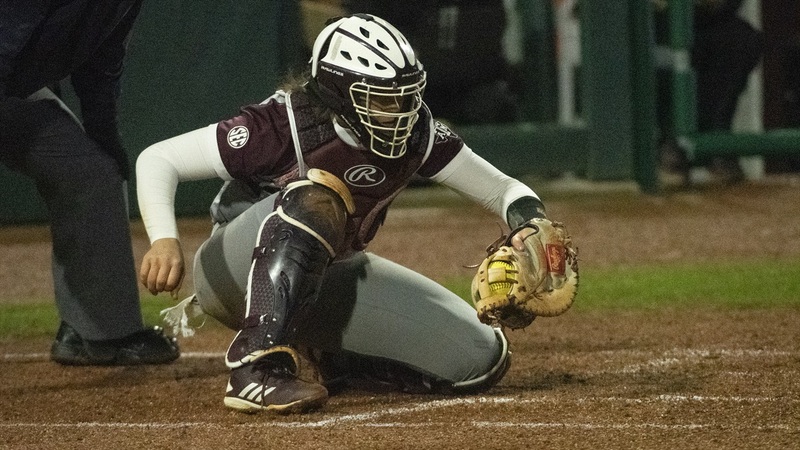 Texas A&M Softball improved to 3-0 on the year after defeating the Northern Colorado Bears for the second time in as many days. The Aggies picked up right where they left off the day before and cruised to a 9-1 victory after just five innings. It was another cold and wet day at the Davis Diamond, but that hasn’t seemed to affect the Aggies. They have been dominant in all three of their wins thus far this season. Texas A&M Junior pitcher Payton McBride was absolutely sensational in this game. She retired the first nine batters she faced and was locked in from start to finish. McBride also contributed on offense, hitting a rocket all the way to the outfield wall for a double in her first of two at bats. Things started to pick up for the Aggies offense in the second inning. They scored five runs thanks to RBI doubles from Kylie George, Kelbi Fortenberry, and Riley Sartain. Sartain has remained on fire after her previous two games and is still posting an on base percentage of 1.000 for the year. Payton McBride was dominant on the rubber for the Aggies. Although Texas A&M’s bats cooled down in the third and fourth innings, it wouldn’t matter thanks to their 5-run cushion. They were able to add one run to their lead while keeping Northern Colorado scoreless through four innings. Northern Colorado’s Dani Young got the Bears on the board with a solo shot home run in the top of the fifth. Nevertheless, this would prove to be irrelevant as Northern Colorado would continue to struggle against Texas A&M’s bats. It was junior catcher Haley Lee who put the final nail in the coffin with her 3-run walk off homer in the bottom of the fifth inning. Lee also contributed a double in the third inning and finished the game going 2-3 at the plate with 3 RBIs. The Aggies are off to a great start after run-ruling their first three opponents of the season. They’ll be looking to continue their winning streak as they get ready to take on North Texas in the second game of their double header. The No. 20 ranked team in the nation has been nothing short of dominant in their first three games of the season. If Texas A&M can keep this up for the remainder of the weekend, they are positioned for a 5-0 start to the 2019 season.